I like things that move and connect. Since I am a visual person, I want to see how items can be put together and interlock. Yes, I can visual concepts in my mind's eye, but to actually see it helps me to understand a concept more clearly. My oldest son has inherited my visual trait. We can talk about math problems and the concepts. Until he actually sees the idea, the concept hasn't taken root.That's why I like the game 5th Gear by Talicor. The rules to 5th Gear are simple. 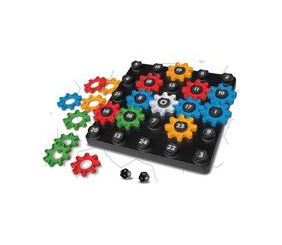 The first player to interlock five of your color gears with the white gear wins. The location where players can place their gears is determined by a roll of the dice. Players roll two 12 sided dice. During each move, the player can place their gear either on the two numbers rolled or the sum of the two numbers. If the connection that you want is taken, you can bump your opponent off that peg and replace it with your gear. The reason why I like this game is because the premise combines math and strategy. The easy course is to simply place your gears on the numbers rolled. That method makes the game move quickly. But, I like to work the concept of adding numbers in your head. The kids must add quickly and see combinations. The "work" on addition problems does seem like a chore; it is a fun game. Plus, no two games are the same. Between the luck of the dice and the math combinations, the game never gets boring. I think that 5th Gear would be great for school aged children or even as a classroom gift. Anyone who has indoor recess during the long, winter months knows that classroom games are so important to keep the kids occupied. 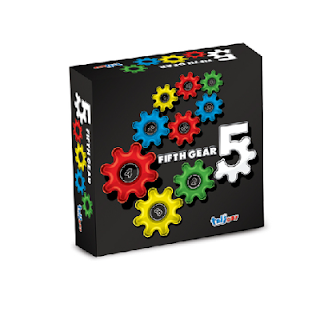 5th Gear by Talicor retails for $29.99. This holiday season give the kids a game that is fun and challenging. Considering adding 5th Gear to the holiday shopping list. Disclosure: I received this game to review from Talicor. All opinions are my own. Great gift idea for any math or problem solving lovers. Thanks for sharing! What a great gift idea... and very affordable... thank you for the idea, would be perfect for my nephew! This is cool! I have a daughter who would love this!